Geotypografika » Blog Archive » Typografika / Detailien: Process and installation. Shoebox Gallery, May 20 through July 6, 2011. 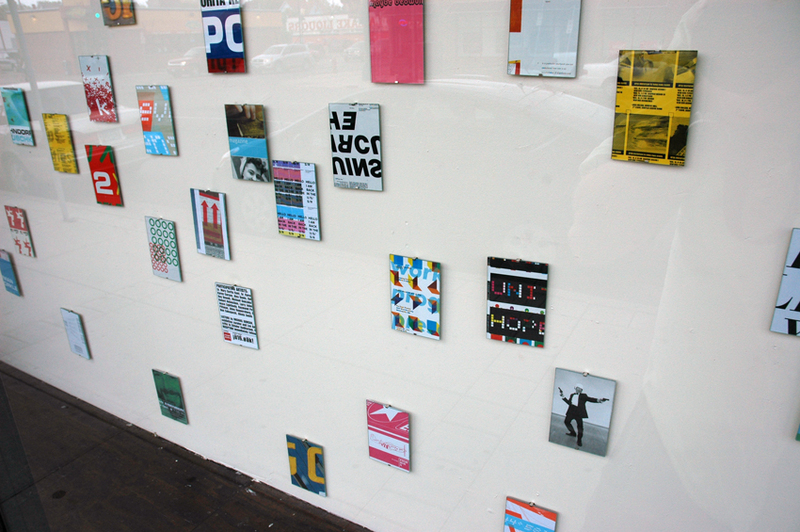 Above: My recent solo show, Typografika / Detailien, officially opened on May 20, 2011 in the Shoebox Gallery here in Minneapolis, MN. I am grateful to the gallery curator, Sean Smuda, for his kind invitation. 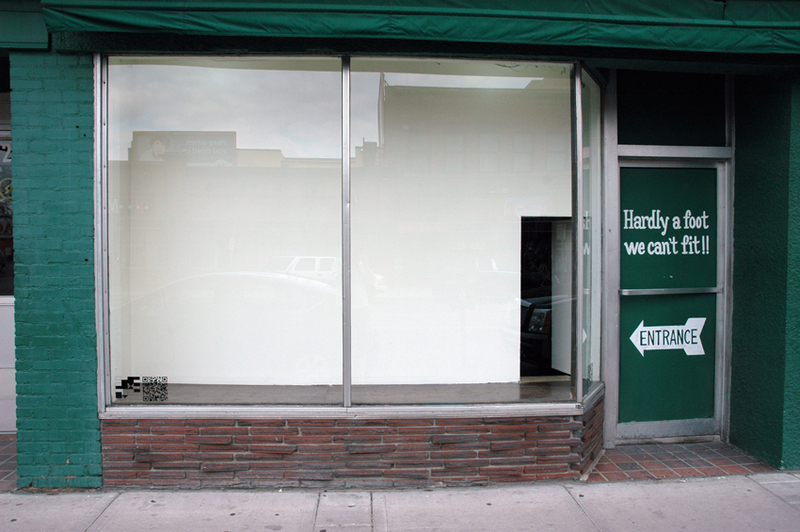 The space itself is located on the corner of Chicago and Lake, and its size was a key factor in deciding what to show. I settled on an idea of creating a conglomerate assembly of 4″ x 6″ detailien (details), and thought it would be a nice way to create new paths both to and from the original pieces. Here are some images from the process and installation that I hope you will enjoy. UPDATE: Reviewed by Patricia Briggs in Scene / Unseen: Viewing Notes, and Thomas O. Haakenson in Quodlibetica. Also listed here in MNArtists. Above: Some of the crops, a laborious but delightful process. It was truly emotional revisiting work from as long as fourteen years ago. One finds many mistakes, new discoveries, and clues to a personal evolution that can be easily forgotten. High time to move on to create new work and pursue new directions. 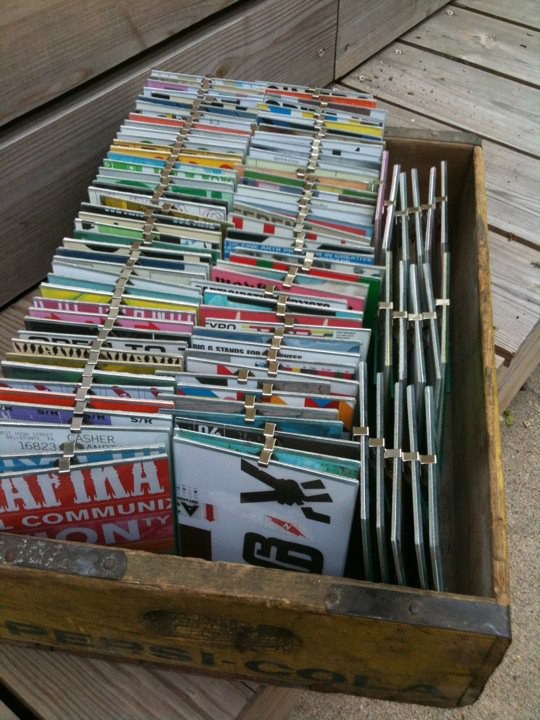 Above: The final stack of one hundred and one 4″ x 6″ cropped examples of my work. Might make for a lovely little book? Above: Another GIF as book study. 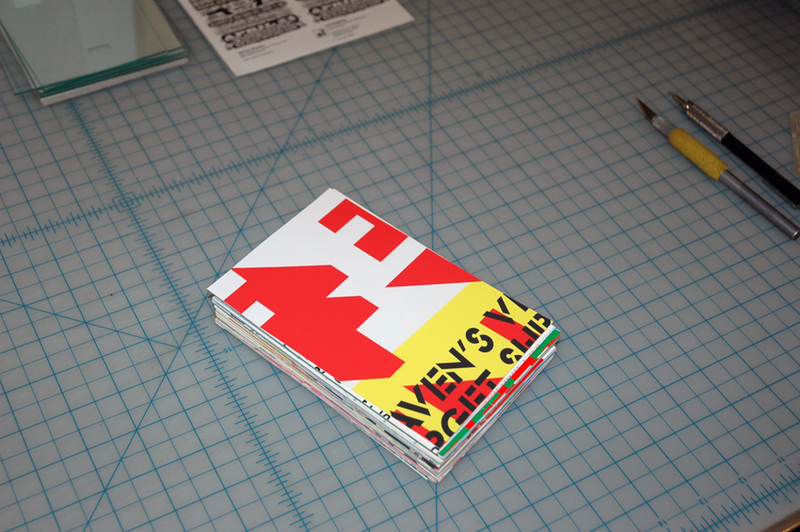 Above: After first cropping the 4″ x 6″ pieces with a cardboard “lens,” it became apparent that many were just a bit off. 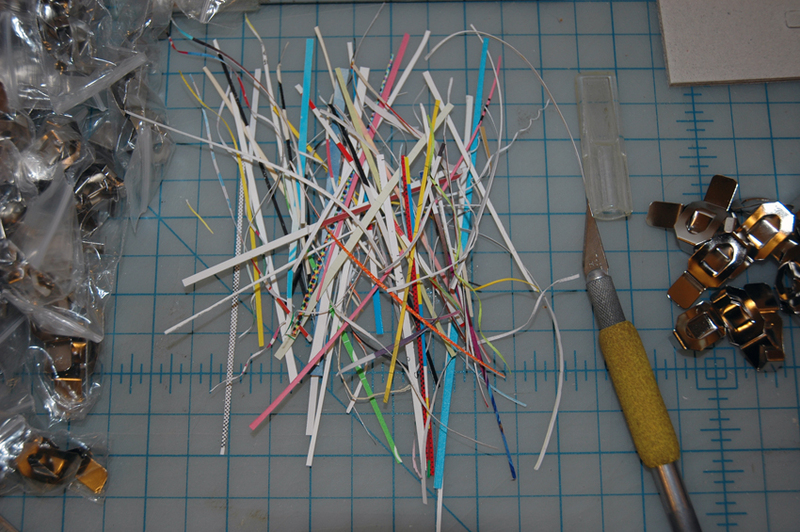 These remnants will be used for another project, I find it hard to throw away these lovely bouquets of color. 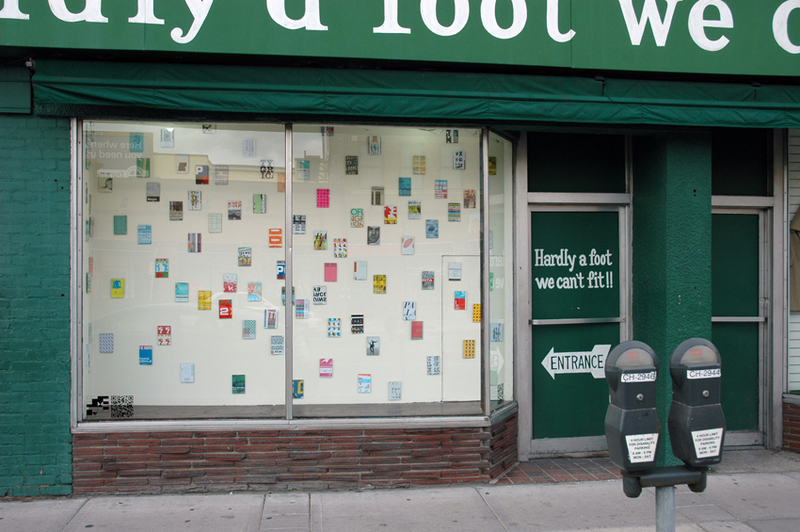 Above: The Shoebox in it’s original form. The small door on the right is the only access. On the bottom left you can see the identity I recently developed for Sean. 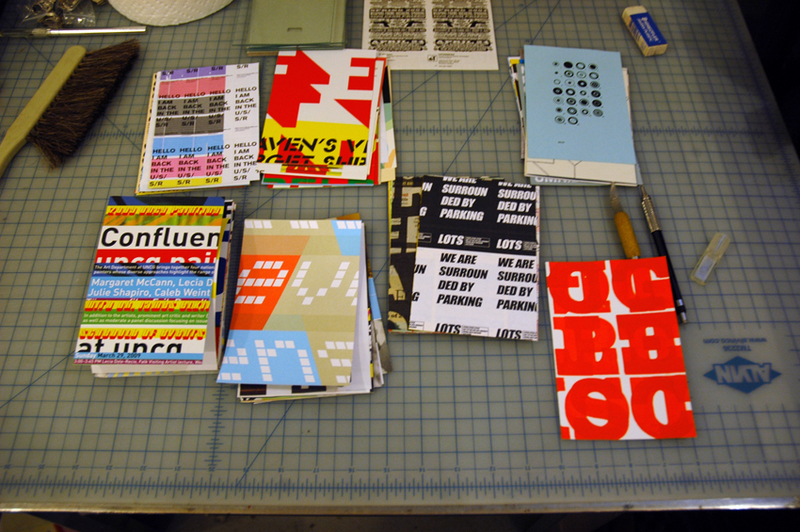 Above: A GIF I created of some of the printed matter I used to create the crops (most range from 1998 to the present). This is dedicated to AJ Warnick. Above: Have graphic design show, will travel. I used a favorite old Pepsi-Cola box to transport the assembled frames to the gallery. More evidence that crops, even slivers, can greatly improve the original work. 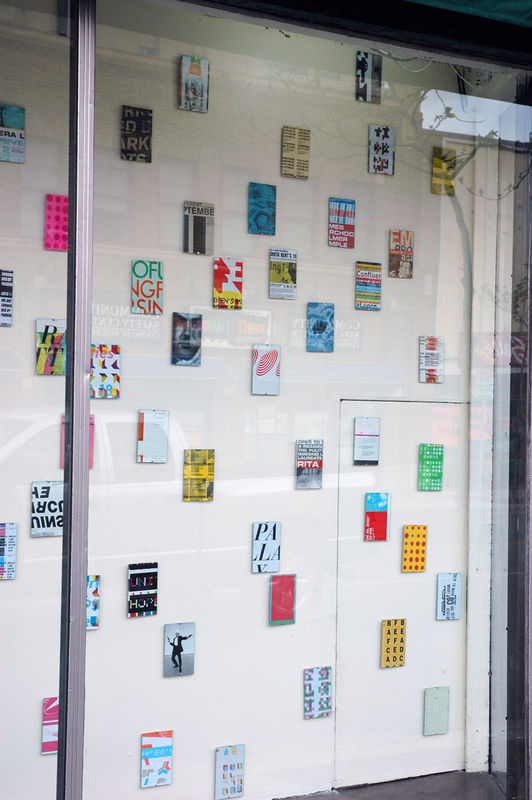 Above: An image of the right side of the gallery after installation. I chose to work solely with color relationships in arranging the pieces. Above: A view from the right. Above: Et voilà! I wore a suit to spite the rain which, gratefully, did not keep family, colleagues, students, and friends from attending. A thousand thanks to all who attended and to those who sent their good wishes and support. The show will remain hanging until July 6, 2011, and I welcome any an all requests to revisit it with you should you be so inclined. For more examples of my work at true scale, please visit my portfolio site, Typografika. Irashai, mina-san, irashai! Oh my goodness i love the gif, and the show was beautiful. A thousand thanks, Leo, I am so grateful for your kind words despite the distance! Vielen, vielen Dank, lieber Hans. A thousand thanks! Erik–the show looks great. I wish I were in town to see it. I want to curate a show–or have you do it–on the topic “what is graphic design, anyway.” Somehow your work is so irreverent that it makes me thing about this. Can you suggest and exhibition catalogues I should see that take tackle this in interesting ways? Thanks so much, Patricia, would love to talk more. 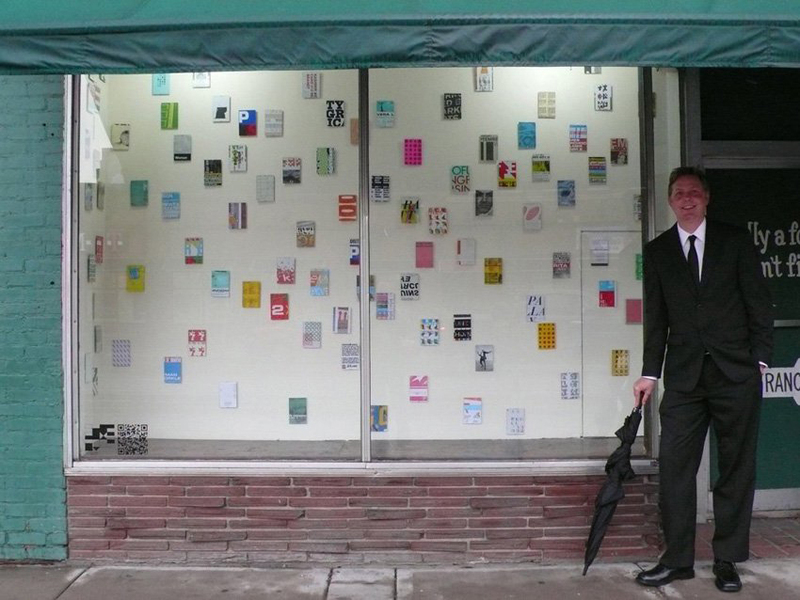 The “Anti-Design Festival” from last September may interest you, http://goo.gl/YjzB , and coming up right now is the super-cool “What Design Can Do” in Holland: http://goo.gl/YjzB The show everyone is talking about now is the Wim Crouwel exhibition in London, http://goo.gl/4fFMG , and that catalogue looks incredible-overview of his incredibly influential work. Let’s talk soon. CARL! A thousand thanks for reaching out across the years. I am so delighted and grateful to hear from you. This looks so fantastic Erik! Very badly wish I could see it in person. Also, SOOO glad you’re keeping those colourful strips, I always loved them and was saddened to through out a the years worth during studio clean-ups. Wow, thanks so much, Colin, so glad you enjoyed. I’ll post the experiment when it is done. Thinking double-sided tape? typography particles aligned with those with which we tread — a nice cross synthesis / collaboration seems somehow aligned with the places our visuals of communication need to appear. oh, not big box store? Sweet. #16 thinking always with good notes. hi leo. let’s offer degrees for custom shoe cobblers. A thousand thanks #2! Much appreciated. Cheers for the RT, Jocundist! Cheers for the RT, Joel! Cheers for the RT, Duke! Cheers for the RT, Claudia! großartig! looks great! can’t wait to get to MPLS! herzlichen dank, nicool! freut mich. du, sag bescheidt wenn und wann ich dir helfen kann. 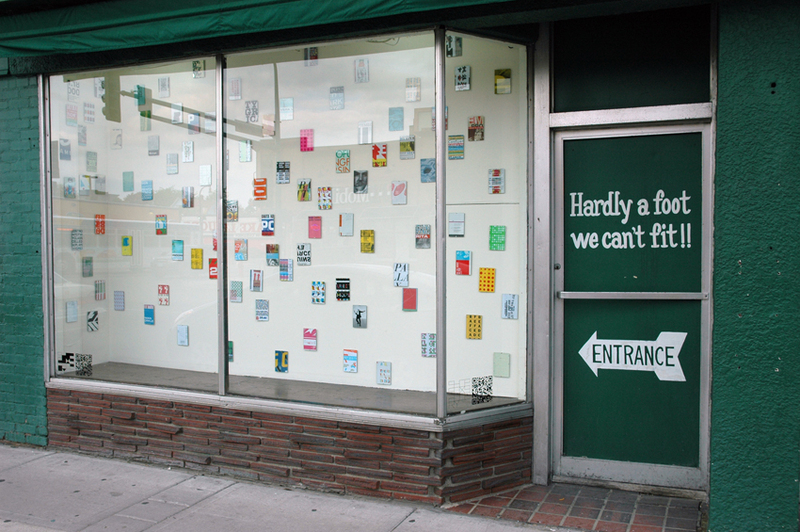 This entry was posted by Erik Brandt on Sunday, May 22nd, 2011 at 5:36 PM	and is filed under Aktuell, Art, Education, Ephemera, Geotypografika, Globalization, Graphic Design, International, Minneapolis, News Links, Photography, Typografika, Typography.